When I was planning my own wedding there were so many scary, daunting, new experiences that I couldn't even begin to imagine making my own bridal bouquet. It's fine, leave it to the professionals, I'll pay eye-watering amounts of money. Guess what, I really regret that. Now, two years on I'm older and wiser and I would love to encourage brides to be brave and take on this challenge (it's not really a challenge, challenges aren't this easy), because there's nothing to it! This is an Autumn bouquet because it's Autumn and these were the flowers available (and apparently in season). If you're making you're own bouquet it's no good saying "I'm not getting married if there aren't peonies in my bouquet!" or "I will have an all hydrangea bouquet to go with my blue theme", because chances are that the day before you're wedding, when you're doing your flower shopping, there won't be a single peony or hydrangea in the country. They'll be out of season, or there's a drought some where or they're sold out. My advice is to gather some bouquet inspirations (hello Pinterest), choose a palette that will match your wedding and then head to the flower markets at 5am. Don't be too rigid in your ideas and colour preferences, this season it's all about mixing colours and textures, using native plants and greenery, and being brave. If you would like to get a better idea of the flowers that'll be around when your big day arrives click here. Flowers, I found poppies; roses in pink, pale pink and white; grevillea; hyacinths, chrysanthemums and carnations. Remove all the leaves from the stems of your flowers, this will make the bit you hold a lot smaller and more manageable. To create the base for your bouquet, start by gathering a few of your bigger flowers together. Then wrap some floral tape around the steps to keep them secure. Now add some of your smaller flowers to the arrangement. 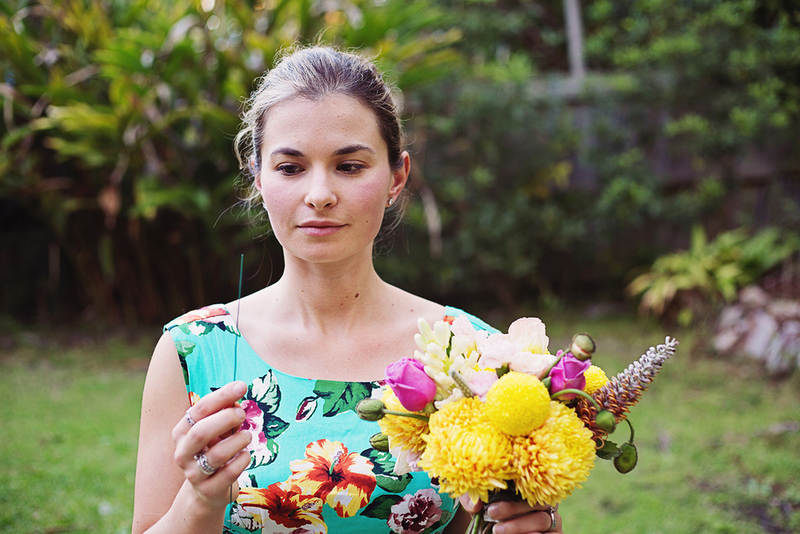 The secret is to add them in small clusters all the way around your bouquet so that it looks balanced and concentrate on making the shape round as you go. Once you're happy with the shape and arrangement of your blooms wraps some floral tape around the stems to keep them secure. To add this tape, hold the stems together tight and wrap the tape as tight as you can, go up as far as you can on the stems. Then grab the stems further down and start wrapping the garden wire around the "handle" area. This will keep the stems together when you start doing a final, tight taping. Start doing your final taping. Tightly wrap the floral tape around the entire "handle" area. Using the pruning shears, cut all the stems to the same length. Make sure they are at least long enough to hold with two hands. It's ribbon time. Pin the ribbon to the bouquet, leaving one quarter of the ribbon loose to make a bow with. Start wrapping the other three quarters of the ribbon around the stems making sure to hide all the floral tape. Wrap down and then up the stems so that the last quarter of the ribbon can be pinned down next to the first. Make a pretty, droopy bow. Fold the ends in half and cut on the diagonal towards the ends.